‘Tis the season… John Piper Book Giveaway | who am i? I love books. Always have. I have a lot of them. Maybe too many (if that’s possible), and almost certainly more than I will ever live to read. So I’ve decided (since it’s almost Christmas) to give a few of my books to one of you. All you have to do to enter the giveaway is leave any comment below. The contest will end two weeks from tonight, at midnight central time on December 15. I’ll draw a name and announce the winner in a new post on December 16. Since I have no idea what it might cost to ship internationally, the winner will have to provide a U.S. shipping address. I’ll mail the books promptly (once I receive your shipping information) by media mail, which means, unfortunately, that you probably won’t have them by Christmas… but then I never said I was Santa Claus. I have a small library consisting of about 200 books. I have them shelved in an order only I could use. When I am doing my bible studies I come across a thought that I know is right but need confirmation so I pull a few commentaries, bible studies and maybe a book written on the subject or verse to see if others think the same way. It has helped to better secure my faith as I travel through this old world. The TULIP booklet is of interest to me, if available. Thank you for your kindness in giving away these books. Piper is one of my favorite authors. Thanks for the contest! Merry Christmas! I’ll take a shot at it. Surprisingly I don’t have any of these as of yet. Very nice, thank you. Not familiar with the Rain tract. Thank you for this opportunity :-)! Thanks for doing this, brother. Always in the mood for a John Piper book! how generous. I love books too! Would love to enter this one! Very generous, thank you! I appreciate your generous spirit! I hope whoever receives these books is blessed tremendously by them! Well this would be a great present! This would be a great resource. Thanks! Thanks for the giveaway. I’d like to be entered. A great contest! Whoever wins this will be greatly blessed. Thanks for the generous offer! What a great gift to give someone! Thank you so much for this opportunity! God Bless! YAY! Piper books!! Thanks for the contest! That would be such a great gift, that would keep on giving. Thank you for this awesome giveaway! 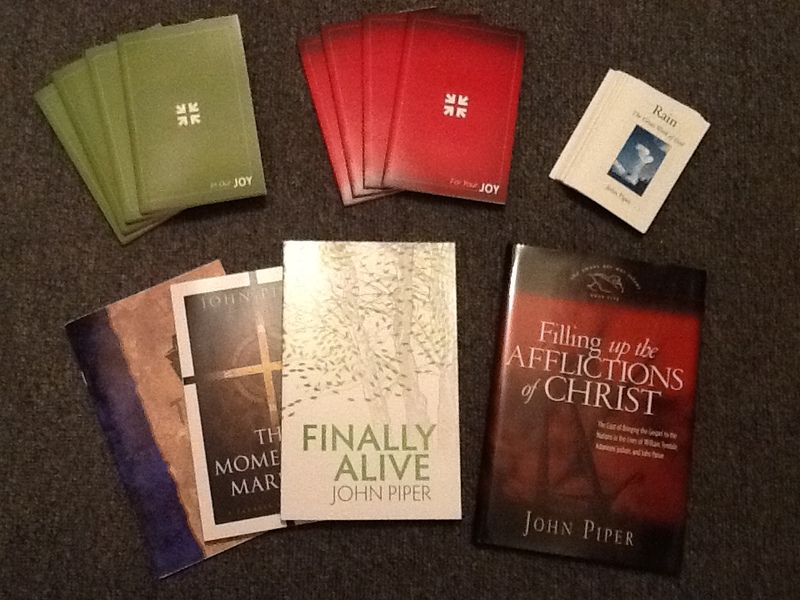 Nothing like a few John Piper books to round out the 2012 reading list! Got directed here by another blog. Enjoyed the visit. Great Idea! I don’t have many Piper books and this could save me some serious cash! Some to keep, and to give away… good deal! John Piper’s books have greatly blessed & enriched my spiritual life!